Located an hour north of San Diego in gorgeous Southern California wine country, Temecula, California, is a city you’d be proud to call home. Named after the Native American tribe that first inhabited the area, Temecula attracts visitors with its pleasant weather, fun activities, and friendly residents. There is a wide variety of Temecula real estate options for those who are considering moving to this beautiful city in Riverside County. Tourists already recognize the charm of this remarkable city, and with the wide variety of property for sale in Temecula, a great fit is waiting just for you! When you purchase a home in Temecula, you are joining a welcoming community with plenty of entertainment options. For example, you can easily visit lauded wineries in picturesque Temecula Valley Wine Country. With 39 parks and 22 miles of trails, you will never get bored exploring this exciting community. If you’d like to further enjoy the excellent weather, consider attending the Temecula Valley Balloon and Wine Festival. During this June festival, colorful hot-air balloons fill the sky while you sip on delicious wine or enjoy tasty cuisine while lounging near Lake Skinner. If history is more your style, look no further than Old Town Temecula! This part of the city is full of 1890s architecture, antique stores, boutiques, and more. Unlike tourists who come here, you will not have to make travel plans to attend special events, such as car shows, that are held in Old Town. Because there is so much to do here, it’s difficult to imagine wanting to leave. However, Temecula’s wonderful location means it’s only an hour’s drive south down I-15 to reach San Diego. Los Angeles is under two hours away to the north. With such a great location and wonderful amenities, it’s no wonder that tourists flock to this enchanting area. Additionally, this city is a fantastic place to live. 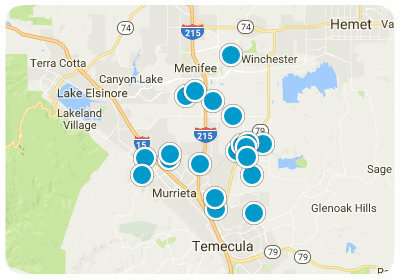 There are many wonder single-family Temecula homes available. Temecula condos and townhomes are another option to consider, and there is also land for sale in Temecula. Tourists visit this spectacular city for its beauty, its golf courses, and its resorts. You will stay and call Temecula home because you want to be part of the warm, welcoming community that values wine, tradition, and nature. If you would like more information about Temecula, California, real estate, please do not hesitate to contact us today!